GABA tea (Gabaron) has the highest GABA content of all foods. Its effect has been proven on high blood pressure, insomnia and stress. The so-called Gabaron (jap . : ギ ャ バ ロ ン 茶) or GABA-tea (jap . : GABA 茶) is a Japanese Green Tea which was developed in Japan as a special health tea subjected to a unique manufacturing process. It is most commonly extracted from Green Tea, however in Taiwan and China the tea has also been produced from oolong tea and black tea. GABA tea has an extremely high content of the special amino acid GABA (up to 50 times more than normal green tea and other foods). But on top of this it also contains all of the other important ingredients of conventional green tea – particularly the catechins – and at similar levels. The ingredients of GABA tea act in a synergistic way creating very strong health benefits especially against high blood pressure, insomnia and stress. In addition, it is also very helpful in improving concentration, fighting fatigue, building muscle growth, fat loss, lower pain sensitivity, supporting the liver, diabetes, leukemia and many more. The special tea complements and works to boost the numerous other outstanding effects of green tea. Aside from its good qualities it also possesses a very popular nutty and warm taste. Green tea is known for its abundance of healthy amino acids. Frequently, however, importance is only given to the L-theanine which creates a special effect in the buffering of caffeine. However the tea plant has many other valuable amino acids that we can put to good use in our bodies. See the contribution amino acids in green tea. A particular amino acid is the γ-aminobutyric acid, shortened to GABA. They can be found in most traditional green tea in significant amounts, up to almost 400mg / 100g but in the special green GABA tea up to nearly fifty times the number. GABA-tea therefore possesses by far the largest amount of GABA in all natural foods. GABA-tea also has, however, high amounts of valuable theanine and alanine. At the Japanese National Institute of Advanced Food Research, the Japanese researcher Prof. Tojiro Tsuchida discovered by chance in 1984 through research on the amino acid theanine in tea on a peculiarity of nitrogen metabolism. By the addition of nitrogen to the tea leaves after harvesting and before the tea leaves were steamed large amount of the specific amino acid GABA were being formed. For some time now the particular health benefits of GABA have been well documented, including, in particular its strong hypotensive effect (see FIG. 4, p 648). From this discovery and following successful trials on hypertension patients in 1985, with the help of colleagues Murai, Omori and Okamoto, a new method for processing green tea called GABA (named after Prof. Tsuchida “Gabaron”) was developed. Gaba Tea was first introduced into the Japanese market in 1987 by a farmer from Shizuoka. One of his main obstacles was overcoming during production the development of unpleasant odors. Today he is recognized as one of the leading manufacturers and his production process has been so refined that his GABA tea is appreciated throughout Japan for its taste and is seen as an important green tea. In Taiwan and China GABA is also made from oolong tea or black tea. L-glutamic acid is a messenger of the central nervous system (neurotransmitters) and the precursor of GABA (γ-aminobutyric acid) the most important inhibitory neurotransmitter in the central nervous system (CNS). It modulates monoamines and growth hormones, reduces nerve irritation and thus engages directly into stress management, in the formation of hormones and personality (cf.. 16, p 1230, 23, pp 32f.). GABA is a metabolite of plants and microorganisms that results from the decarboxylation of glutamic acid decarboxylase (GAD). GABA is formed also in our brains as glutamine. It is found clearly in the cells of the cortex and the hypothalamus, moreover, in the cerebrospinal fluid, blood and central nervous system (see FIG. 23, p.32). GABA also plays an important role in cardiovascular function and influences blood pressure (see FIG. 23, pp 32). In addition, it stimulates the growth hormone Somatropin (GH) and triggers muscle building and fat loss. At the same time GABA is an important inhibitor of hormone secretion in different endocrine cells. At the heart of scientific research with regard to its use against diabetes, GABA has been shown to be an inhibitor of glucagon secretion in alpha cells in the islets of Langerhans in the pancreas. In GABA tea an exceptionally high content of the two amino acids alanine and GABA can be found. In addition, the tea also has high amounts of the important amino acid theanine as well as containing all the other healthy ingredients found in conventional green tea. Amongst which it has an unusually high content of catechins (a little less of EGCG and EC, for more EGC and GC) and major free fatty acids. (see FIG. 4, p 652). This combination of specific amino acids, catechins and other important ingredients enables the GABA-tea to possess specific health benefits for blood pressure, the central nervous system and the heart / circulatory system. For many centuries, the medicinal properties of plants containing amino acid GABA has been well documented. Specifically, the flowers of the Chinese Windmill Palm (Trachycarpus fortunei) and the Chinese medicine Ougi that is obtained from the “Mongolian Astragalus” has been highly emphasized. The Chinese windmill palm has about 34-35 mg GABA at 100g (approximately 50mg when converted to a dry mass) and is already at this level known for its antihypertensive effect (see. 1, p 818). It is used as an antihypertensive agent in Asia. However in comparison to the up to 400 mg of GABA found in 100g GABA Green Tea the benefits of the Chinese Windmill Palm are relatively modest. Astragalus Mongholicus also has significant GABA levels and is ranked among the top 10 Chinese medicinal plants in the TCM. It is not only used to treat high blood pressure, but also protects against stress, immune deficiency, colds, strengthens the immune system, heart / circulatory problems, diabetes and cancer. But again here Gabaron Tea has significantly higher levels of GABA. In recent years, GABA has been used in Japan as an active ingredient in various popular medicines produced especially for the brain. In 2001 GABA was classified in Japan as an OTC food, so that since 2004, many GABA-products can be found in the Japanese market. Particularly popular are germinated brown rice and fermented foods. A study on Leukemia in mice found that brown germinated rice with high GABA values as compared to ungerminated rice led to a significantly stronger cell death rate of cultured L1210 cancer cells and significantly delayed the proliferation of L1210 and Molt4 cancer cells. Green tea has large amounts of the important amino acid theanine. GABA tea has a similarly high content thereof. Theanine supports numerous very beneficial properties in the brain, the balancing of blood pressure and also has useful properties in the prevention of cancer (see FIG. 4, p 651). Alanine is known for its positive effect on fat burning, muscle building, physical fitness, in assisting the liver, kidneys and prostate, for strengthening the immune system, aiding sugar metabolism and also as a very good preventive measure against “hangover” (see FIG. 19, 20, 21). Lysine, isoleucine and leucine are present in GABA tea in much larger quantities than in traditional Green Tea. They are considered essential nutrients for the liver and the neurons in the brain and act positively against alcoholism and liver problems such as Hepatic encephalopathy and hepatic comas (see FIG. 4, p 651). 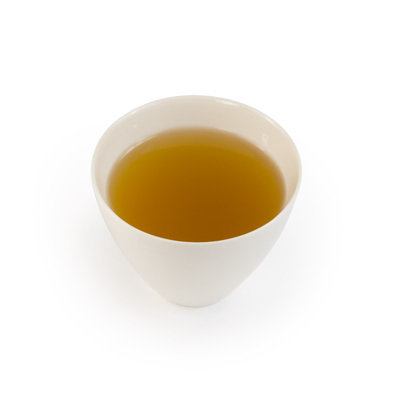 GABA tea contains as well as the amino acids the same ingredients as conventional Green Tea. In other words, the tea is rich in catechins, has a medium-sized caffeine content and retains all other valuable substances. The tea basically has the same effect as normal Green Tea. However, it is different in that the caffeine content can be almost removed by a short infusion time. In contrast the amino acids are absorbed very quickly by the water. – A similar study with GABA milk on hypertensive rats (see FIG. 13). Consumption, recommended amount and make-up of GABA tea is discussed in detail below. It should be pointed out also that high blood pressure cannot be treated with GABA tea alone, but with a combination of other teas. This is illustrated in detail in the article on treating high blood pressure with tea. There are strong indications that this important amino acid exhibits a significantly better health effect when found in natural foods as opposed to synthetic products (see FIG. 10). The three main food groups that contain a lot of GABA, namely GABA-tea, fermented foods (e.g. tempeh GABA) and GABA germinated rice also have numerous other highly beneficial ingredients that exhibit strong synergistic and additive effects. A very good impression can be obtained regarding the current state of research into GABA tea and its effects on high blood pressure from an interview with Professor Tshushida, the discoverer of GABA tea. Tojiro Tshushida is the Head of Planning and Coordination Research of the National Institute of Advanced Food Research. The interview is published in Japanese in the original on the website of jafra.gr.jp/Tshushida and is reproduced in the following excerpts. “Through research on the biosynthesis and degradation of theanine in tea leaves I found out that theanine converts to glutamic acid and ethylamine and beyond that glutamate is subject to an abnormal metabolism under certain conditions. When storing the tea leaves under oxygen-free conditions or in nitrogen nearly almost 100% of glutamic acid is converted to γ-aminobutyric acid (GABA). The antihypertensive (lowering of the blood pressure) effect of γ-aminobutyric acid was first published in 1963 by the research conducted by Stanton. This had been tested in animal experiments on cats, guinea pigs and dogs. In cats, however, a 100-times higher dose was required in order to achieve the same results. Following these results, the natural conclusion was human testing. The experiment began in 1985 where we carried out experiments with Ichibancha (first crop) and Nibancha (second crop) and in both cases we drew very positive results. A new tea was born. It looks the same as normal Green Tea, but the glutamic acid turns into GABA and the aspartic acid to alanine, almost up to 100%, as by glutamic acid, but the rest showed no change. The experiments in vivo were carried out with the help of Prof. Oomori (Otsuma Women’s University). In collaboration with the doctors at the hospital, he treated 13 patients daily with the GABA tea, at a daily recognized amount for green tea. Half of the patients showed an improvement in blood pressure leading to the hypothesis that if you only already take daily a normal daily amount of GABA tea, you could expect a reduction in hypertension. Together then with Takeda Food we continued the development of the tea and thought even at one point to patent it. But I did not want the tea farmers to have to pay royalties. At that time, the tea production in Japan had fallen from 100,000 to 90,000 tons, and I wanted to give young Tea Farmers a good reason to involve themselves more and to be excited. We called the tea Gabaron because we thought “GABA tea” as being too boring and at the time oolong tea was becoming very popular, so we decided to choose the “ron” shape of “Oolon”. But everyone is allowed to use this name. There have never been any medical reports of any side effects from consuming larger amounts of GABA. For example, it is used intravenously in grams. So I knew that there would be no problems with side effects from drinking the tea. An open question was whether GABA crosses the blood-brain barrier or not. Does it lower high blood pressure by acting directly in the brain? Our previous understanding was that it would not cross the blood-brain barrier. However, we found in animal experiments with mice, under the use of isotopes by Prof. Omori, that it showed up into the brain. Nevertheless, we are convinced that GABA does not trigger many side effects, even though it reaches the brain. Human emotions are controlled by the neurotransmitters dopamine and serotonin (or by the amine system), but the γ-aminobutyric acid suppresses the excited nerves in the inhibition system. If we consume GABA in our diet, we do not know with certainty whether it goes directly to the nerve synapses. Gamma-aminobutyric acid is a naturally occurring amino acid. It is one of the non-protein genic amino acid. It is the most commonly found acid in this group and in humans it acts as a neurotransmitter. Gamma aminobutyric acid (GABA) can be found in many foods, plants, bacteria, insects and animals (see FIG. 23, p.32). In foods it is however usually present in only very limited quantities. Rich in Gaga but still very limited when compared to GABA tea are tomatoes, potatoes are (preferably steamed), germinated rice, eggplant, soybean, mulberry leaves and certain citrus fruits such as grapefruit and oranges (see FIG. 23, p.32). Fermented foods also exhibit through the chemical processes of the microorganisms during fermentation higher GABA levels (cf.. 16, p 1230ff.). Particularly high GABA-producing microorganisms include lactic acid bacteria (lacto acid bacteria, LAB). This is used in the development of food products with the highest possible GABA content. Other significant amounts are found in carrots: 6mg, beets: 4-8mg, cucumbers 7mg, pumpkins: 10mg, carbon: 8mg, green peppers: 4mg, Edamame: 6mg, Shiitake Mushrooms: 8mg, Peach: 13mg, Figs: 9mg, Kiwi: 11mg. But even with the consumption of large GABA amounts through foods, the GABA Green Tea still shows the highest possible health benefits with its combination of appears other important ingredients. 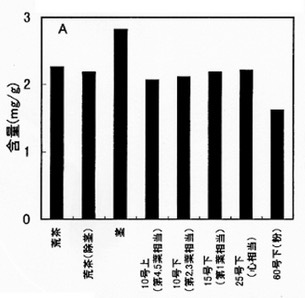 In a test in 1987, Japanese researchers exposed green tea under anaerobic conditions to different gases at room temperature and analyzed by a one-minute steaming of the tea leaves the content of amino acids in the resulting freeze-dried powder (see FIG. 1, p 818). The green tea seed variety Yabukita was used. Yabukita is most common found seed strain used in Japan for green tea. It was found that under nitrogen exposure the tea increased massively its GABA amino acid content from about 13 to 234 mg per 100g tea. The same happened with the amino acid alanine, which rose from about 15 to 165 mg per 100 g of tea. At the same time the content of aspartic and glutamic acids was almost completely reduced (glutamic acid decarboxylase a.k.a. GADA). Similar effects were achieved by the use of carbon dioxide instead of nitrogen. However, since nitrogen is easier to handle, the Japanese producers have focused on this manufacturing technique. There is a broad spectrum of information on the content of GABA in traditional Green Tea. The Japanese research organization NARO states on its website, for example, 8mg / 100g GABA can be found in Aracha significantly lower than the 24-39mg found by Tsuhshida (1). Through repeated anaerobic treatment on the other hand NARO scored 374 mg in Aracha and up to 571 mg in stalks of green tea, which in turn significantly exceeds 234mg found in the Tshushida research. A study from Wang (4) compared the amino acid content of 28 different Green Teas and 28 GABA teas from Taiwan. It shows the same conversion process between aspartic acid and glutamic to GABA and alanine. The Taiwanese GABA tea sourced from different seed varieties showed on average about 181 mg GABA (± 51 mg) as opposed to the approximately 17 mg (± 9mg) displayed in the Green Teas. The analysis also showed that GABA tea has a significant amount of other important amino acids. The levels of threonine, valine, tryptophan, isoleucine and leucine are similar to those found in traditional green tea. Lysine, isoleucine and leucine were even significantly higher. Only phenylalanine was significantly lower. Arithmetic average ± standard deviation. Taiwanese spring and summer harvests. GABA tea: nitrogen treatment 8h and then 3-4h anaerobic mixing. Repeat the entire process a second time (22-24h in total), then 8h anaerobic fermentation and cushioning, rolling and drying. 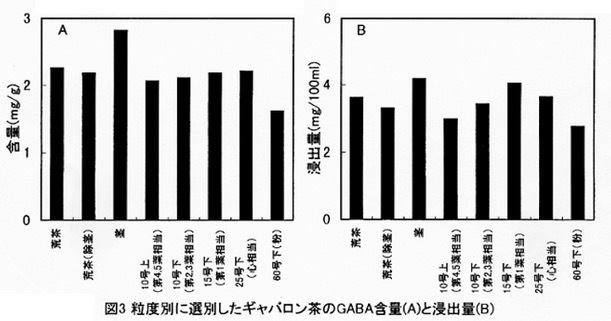 As reported by the Japanese Research Institute NARO, GABA content can actually be increased even higher by treating the tea leaves with oxygen at the end of the process and then further re-treated with nitrogen (see FIG. 11). This leads to a change from aerobic and anaerobic treatment. This is because new glutamate is formed by the oxygen needed as a basis for the transformation into GABA. This process can be repeated several times but the amino acid alanine cannot be increased by this method. The repeated aerobic and anaerobic process does, however, little good to the taste and harmony of the tea which is why leading tea farmers therefore avoid this technique. In conclusion it can be stated that GABA content in conventional green tea has a range of about 8 to 39 mg / 100g of tea. In contrast and depending on the quality, GABA tea has a GABA content of about 150 to just under 400 mg / 100g of tea, which is an increase of about 4x to 50x almost. Repeated treatments with nitrogen achieve even higher values, but are at the expense of taste and general harmony of the tea and therefore should be avoided. In tea stems up to 571mg per 100g tea GABA were found (see FIG. 11). The same investigation by Tshushida (see FIG. 1) showed in relation to the total catechin and caffeine content only minor differences. The addition of nitrogen instead of oxygen ensures an even better preservation of the catechins. GABA tea has approximately catechin and caffeine levels in similar levels to that of Green Tea from which it’s made. A closer look at Wang’s analysis of the individual main catechins (see FIG. 4) made it clear that GABA tea through the oxidation has less EGCG and EC. The non-ester catechins EGC and GC on the other hand are more pronounced in GABA tea. Arithmetic average ± standard deviation. Analysis after 20 minutes infusion in water at 80 ° C. For more details see table above. As for all amino acids found in Green Tea, the same applies for GABA that the levels in the first harvest and the young leaves are by far the highest. The same applies to the GABA-tea. If it is made from the first harvest, it will have significantly more GABA than later harvests. The same applies for Alanine. The below chart shows that stems have the highest GABA content with about 2,8mg / g tea, followed by the buds with about 2,2mg / g and the equally strong 1. Leaves and Aracha without stalks. It is however to be added that GABA tea from top Japanese farmers achieved a GABA content of nearly 4mg / g. Since little caffeine is present in the stalks consideration was given as to whether a GABA Kukicha tea (Kukicha = Stem) would represent an even gentler variant for enjoying at night. However, it has not yet examined whether the lower levels of catechins have therefore a smaller antihypertensive effect (see. 10). Which is Better – GABA Tea from Green, Black or Oolong Tea? Another interesting study undertaken by Tshushida (see FIG. 4) measured the levels of the amino acids in oolong tea and black tea after exposure to nitrogen. The first observation was that GABA levels were significantly enriched in these teas treated by the nitrogen treatment. This however was best managed by subjecting the tea leaves with the inert gas after and not before the wilting of the leaves. For the experiment, Oolong and Black tea from the Benifuuki seed strains was used and harvested on June 15 (Nibancha, Second Harvest). The second result was striking in that the GABA tea made from the Green Tea (Yabukita) had in comparison slightly lower GABA levels (about 216 mg / 100g) than the Oolong GABA (246mg). It must however be pointed out that the Japanese market is known for a GABA teas made from Green Tea which achieves a GABA content of almost 400mg / 100g tea. This is evidently the highest quality in the market. Although the Oolong GABA tea (Gabalong) from the seed variety Benifuuki contains a lot of GABA, it has low levels of arginine, theanine, serine, alanine than the green GABA (especially from the first harvest). Against that though the Oolong GABA has more glutamine, asparagine and aspartic acid L-than GABA Tea from the Green Tea out of the first harvest. The latter two substances are still higher in Green GABA’s Teas second crop (July 2). In addition, it is obvious that the nitrogen treated Black GABA tea has substantially less GABA and alanine but alternatively has the highest values ​​of aspartic acid and glutamine. Since it is well known that Green Tea in comparison to Oolong tea & Black Tea is full of a healthier mix of ingredients it is recommendable that GABA Tea should be brought originating from Green Tea. Oolong tea and Black tea do have special ingredients and health effects that are beneficial but these are less apparent and not for everyday use. Note: “Oolong 1” and “Black Tea 1” were treated before wilting with nitrogen. Oolong GABA and Black GABA were treated after wilting. Oolong and Black Tea came from the Benifuuki seeds. Green GABA was exposed to wilting process and was not fermented. It originated from the Yabukita seeds. 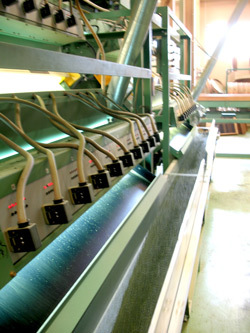 The production of GABA tea goes through four main steps. First, the tea leaves are (best of the first harvest) are harvested and then freshly housed in a warehouse. There, they are enriched without oxygen for several hours with nitrogen. Through this particular amino acids in the tea leaves are transformed into GABA and alanine resulting in the desired high GABA levels. The remaining ingredients remain almost completely unaffected. Finally fermentation / oxidation of the tea leaves is carried out. Usually in Green Tea this is caused by gentle steaming or by pan heating. 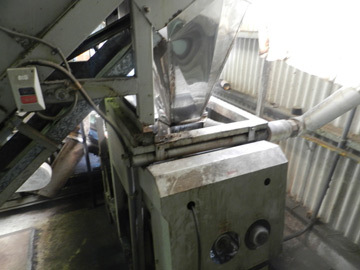 Nowadays the tea leaves are placed in special machines and “massaged” and finally deprived of moisture to dry out so that sufficient durability is ensured. Some manufacturers use the fact that multiple repetitions of the nitrogen-treatment lead to increased GABA levels further still. However, this produces very adverse effects for the taste. When buying the tea look for ones that have been treated only once and as such palatable. There are two main aspects that determine the quality of GABA Tea during production: The fatty acid Ester created during the chemical conversion process produces a very unpleasant smell and taste, which is then corrected by a gentle and clever roasting process (see FIG. 1, p 818) called Kameiri. Only a few manufacturers have been able to improve the manufacturing process so that the tea remains undamaged and does not taste musty but has a pleasant, earthy, slightly nutty flavor. As you can then imagine these leading Japanese manufacturers guard their manufacturing secrets. When buying one should explore the teas on the market to compare the quality -GABA tea is not unpleasant, but should have a well-rounded, harmonious and slightly nutty taste! This tea is said to have the highest possible GABA content. A good GABA tea should have at least 150mg GABA / 100g tea. The best teas should have levels above 300mg which some studies have shown can have even up to 400 mg. 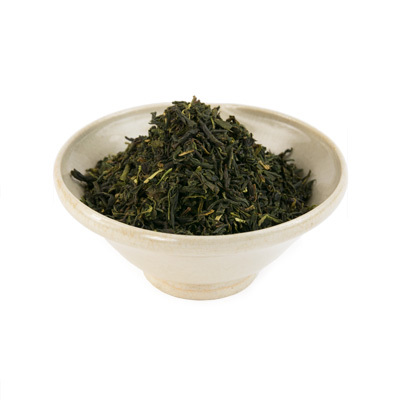 This is only achievable with tea from the first harvest (Ichibancha) and from young leaves. This is absolutely essential as specific health benefits only occur from daily intakes of about 10-20mg GABA only a part of the GABA can dissolve from the tea leaves into the tea water. The texts below explain exactly what it is required for the preparation and daily intake of the tea. Caution is advised when production has involved a multi-pronged treatment with nitrogen. Although this increases the GABA content even further, it is definitely at the expense of taste and harmony so one should purchase Gabaron that has been treated only once. In research carried out by Lin. (see FIG. 5) an extract of GABA tea was tested in different temperatures (25, 50, 75 and 95 ° C) in water and in different ethanol solution levels. 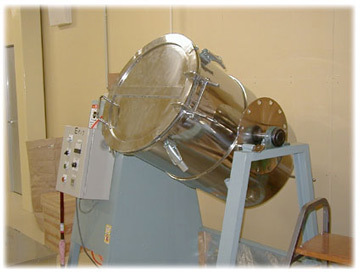 Every batch was then centrifuged for 30 minutes at 100 rpm and then for 10 minutes at 6000 revolutions per minute. Subsequently, the respective levels of GABA and catechins was measured. The following table shows the results per pure water solution and at the end of the table the maximum dissolved levels and its drawing temperature and solution ratio. Thus the final value can be interpreted as the maximum soluble value. Substituting the individual values in relation to the maximum detachable value, you get a general idea of the influence of the drawing temperature on the solubility of the active substance. It should be taken into consideration that unlike the relatively short brewing time in normal tea, the experiment allowed for a steeping time of 40 minutes in a centrifuge. The actual average normal tea infusion is about 2-3 minutes steeping time meaning significantly lower results. Nevertheless, it was found that the amino acids GABA and theanine have a significantly increased solubility at lower draw temperatures than as most catechins (especially in the case of ECG, GCG, EGCG). * Ethanol content and temperatures can be found in the table above. Source: 5, p. 68, calculations are made by us. A better idea of how much GABA actually dissolves into the tea water was investigated by the Japanese research institute NARO (10). They tested 3g GABA tea brewed for 5 minutes at boiling temperature in 200ml. The measurement was made for the individual parts of the plant (see above and elsewhere in the description of the following table). The teas originating from the different parts of plants saw the GABA dissolves through the intensive preparation completely in the kettle. *Aracha (tea without roasting- / drying finish), 2. Aracha without stems, 3. Stems 4. Oversize 10 (4th and 5th leaf) 5. Undersize 10 (2nd and 3rd leaf), 6. Undersize 15 (about the size of the first Leaves), 7. Undersize 25 (bud size), 8. Undersize 60 (powder). According to Japanese researchers (NARO and Green Tea Shizuoka Research Center) at least 10-20mg GABA per day are needed to ensure any significant health effects. For certain problems and to build muscle or fat loss higher amounts would be needed. Current research on this topic is highlighted below. For the prevention of most mild health problems a daily intake of about 10-20 mg of GABA is recommendable. This should be continued until symptoms stop but with a warning that these types of cures should only be undertaken preventively for several weeks. Thereafter, a permanent change in the daily basic package (Gyokuro, Sencha, Bancha) would be advisable. To determine how much tea should be drunk for this amount the below text will explain. Assuming a solubility rate of the GABA at about 50% in the tea water when prepared gently and about 80-90% preparation when using a high quality 300 GABA (> 300g / 100g tea), it can then be calculated that for 10mg GABA, one should use about 1-2 generously heaped teaspoons depending on how intense you want the tea. For 20mg GABA then the double would apply. Pro rata therefore more tea is required when a lower quality of tea is used with lower GABA levels. Most good GABA teas have a content of 150-200mg GABA / 100g tea and peak GABAS have around 300-400mg. The table below shows how many teaspoons of tea a day is needed to reach the recommended amount of 10mg or 20mg GABA in the tea water. The number of teaspoons corresponds also to the number of tea bags by the way, as these usually weigh 3g. GABA 300: Assuming that the tea 300mg of GABA has to 100g of tea. GABA 150: Assuming that the tea 150mg of GABA has to 100g of tea. Gentle preparation: see below, 70 ° C for 30 seconds. Solubility – 50%. Intensive Preparation: see below, 90 ° C for 3 minutes. Solubility – 80-90%. Assumption that 1 heaped teaspoon weighs the same as 3g of GABA tea. Source: own calculations based on the investigation of NARO, cf. 10th. Note: GABA-tea powder weighs about 3.5g per well heaped teaspoon as opposed to about 3g per well heaped teaspoon with loose tea leaves. Therefore the use of powder leads to roughly a 17% decrease in value. In more pronounced problems, such as moderate hypertension, insomnia and increased physical and mental exhaustion it is recommendable to take around 50mg of GABA daily (see FIG. 5, p 67). With more pronounced hypertension it is recommendable to take a mixture of GABA tea with a combination of other types of tea (see the article for hypertension) and combine with a change in diet and lifestyle. A high intake can still be achieved by drinking tea alone. Through gentle preparation (70 ° C at 30 seconds) GABA teas release mainly the amino acids into the tea water and only lower levels of caffeine, catechins and especially tannins. Thus one can drink significantly larger amounts of the GABA-Tees, as opposed to normal Green Tea. 5 servings per day, each with 2 generous teaspoons should have no side effects and will provide the body with approximately 45mg of GABA based on a GABA tea with 300mg / 100g. For tea with about 400mg GABA content per 100g, this would be even approximately 60mg GABA. This amount should then be only taken 3 times per day. The perfect option would be to combine this further still with GABA-rich foods, such as potatoes (preferably steamed) and tomatoes, germinated brown rice (treated with nitrogen – about 25mg GABA / 100g) or GABA tempeh and certain fermented foods. Since germinated GABA rice also has more than about 25mg / 100g GABA, you could in essence by this alone absorb by eating daily amounts of 150g GABA rice roughly 38mg of GABA. These larger amounts can no longer be absorbed through natural foods. It is then recommended that pure GABA is taken via GABA-capsules. The GABA should originate if possible from a natural fermentation process, be as pure as possible, without additives or pressed materials. Higher doses though need to be limited to a defined period or until significant improvement of symptoms can be seen and with at least a break of 1-2 weeks every 4 weeks. An explanation of the side effects and disadvantages occurs in the next paragraph. Somatropin is an important growth hormone in the human body. Low amounts of Somatropin result in short stature with reduced muscle mass, an excessive body fat mass and an excessively low bone mineral density. In addition, this promotes cardiovascular risks and a decreased life expectancy. Increasing Somatropin promotes the development of muscle mass and fat burning. The effect is can be felt without muscle stimulation, but of course even more with muscle training. The amino acid GABA is known to lead to an increase of Somatropin in plasma. Bodybuilders often use high amounts GABA powder for this reason. However too much Somatropin in the blood plasma can have adverse effects and leads to excessive growth of certain body parts (e.g., nose, chin, fingers). At the same time a dose of GABA can lead to excessively increase of the hormone prolactin. Too high prolactin values in women results in possible infertility and problems with menstruation. In men prolactin can lead to loss of libido and impotence. A study of Cavagnini (carried out in 1980 and not as erroneously often cited as a brand new study by the First Medical University of Milan) on 19 individuals (with 18 placebo control subjects) examined the relationship of orally taking GABA and somatropin & prolactin levels in the blood. When administering a daily dose of 5g GABA, a significant increase of Somatropin was recorded in the blood (see FIG. 18, p 149ff.). In all 19 subjects the value increased from 2 ng / ml after 15 minutes and reached after 90 minutes an arithmetic average of about 11 ng / ml at its peak. After which the values reduced steadily and after about 180 minutes was back to the original baseline. Therefore through oral administration of GABA a significant increase in growth hormone Somatropin can be achieved. However the studies also showed that in 5 test subjects, irrespective of age, the administration led to a significant increase of prolactin values which can have negative effects on the body. Eight of the subjects were administered a daily dose of 18g of GABA for 4 days. However, this high amount resulted in a significant reduction in the rise of Somatropin rise but led to a sharp increase in prolactin levels. On subject examination of these high doses only a few individuals showed some side effects, including a burning sensation in the throat and a feeling of shortness of breath for a few minutes. With long-term use a fatigue in the legs and a general tiredness was reported by all subjects (see FIG. 18, p 150). Ideal therefore would be that proper intake of GABA would increase or stimulate Somatropin values to a level that only the positive effects of muscle building and fat loss, would occur would signs of fatigue. In addition, the prolactin value would remain stable. The above-mentioned research suggests that in daily intakes of GABA doses in the gram range, the negative effects could already predominate. The correct dosage is likely to be relatively difficult to find for bodybuilders. Presumably the border between positive and negative effects are in daily several hundred mg GABA, but this can only be known on an individual level. GABA Tea or GABA Powder? Pure GABA from dietary supplements, such as GABA capsules. In comparison to other ingredients GABA dissolves relatively easily in tea and quickly in the kettle. After a short brewing time almost all the GABA from the tea leaves is absorbed into water. Dissolved in warm water, it is far more bioavailable than would be the case when taking powder in an unheated smoothie or juice. The use as tea is in terms of intake efficiency is therefore quite comparable to tea powders. Nevertheless, there are some advantages and disadvantages. Has a better taste than the powder. GABA tea powder when warmed in water has a bitter taste. GABA is released almost completely into tea water during brewing. GABA tea made from natural Green Teas has many other healthy ingredients that develop a synergistic and additive effect. Steeping time can affect which other ingredients enter the water for tea. Even with a short brewing time will ensure that a relatively good amount of GABA will enter the water without the undesired caffeine and tannins. (Note: caffeine in tea is not altogether unhealthy, as is often assumed, but can have an invigorating, positive effect on the body). If one is taking GABA to ensure a good sleep and general calmness then it is recommendable to brew the tea for a short time only. – Powder theoretically allows for larger quantities GABA to be consumed, but the tolerable amount is limited due to the less harmonious tannins and caffeine. More than 1-2 tsp tea powder per day is likely to bring about negative side effects. – The stirring of the tea powder in an unheated smoothie or juice is good for those who don’t drink tea. -Certain practices require high levels of GABA which cannot be achieved through natural food. -With high quality GABA products there is a reliable standardized content of GABA. However there is a danger of overdose if not controlled. -While there is no preparation effort there is however no synergistic effects with the other ingredients in natural foods and after a certain level there are significant side effects. Decisions on how to take GABA should therefore reflect individual health goals made with careful research. When preparing GABA tea it’s mostly about getting as much as possible of the amino acids and in particular of GABA in the kettle. Since the amino acids are highly soluble you may, depending on brewing time and temperature also allow somewhat slower-dissolving substances, especially tannins, catechins and caffeine, to enter the tea. GABA is known to help aid those suffering from insomnia with its calming and relaxing effect and for which it is recommended to prepare the tea with a short infusion time. Leading Japanese GABA tea farmers told us of laboratory tests, which were made in cooperation with a research institute in Shizuoka. It was noted that already about 80% of the GABA content entered the tea after the first short infusion. Per serving – 2 good heaped teaspoons (about 6g tea) should be taken with 0,2-0,3l water brewed at 70 ° C for 30 seconds. Note: Here an estimated 50% of the GABA will be in the tea water with very little caffeine. When it comes to strengthening the positive effects of green tea as a whole, a more intense preparation should be chosen. This is particularly important for high blood pressure, as opposed to stress and liver problems. Per serving – 2 good heaped teaspoons (about 6g tea) with 0,2-0,3l water brewed at 70 ° C for 3 minutes. Note: Here about 80-90% of the GABA will dissolve in the kettle as well as significant levels of caffeine and catechins. When to drink? Ensuring good sleep and muscle growth? The stimulation of growth hormones and the calming effect of GABA works best in the first two hours of sleep and when taken roughly no less than 45-minutes after eating. GABA tea should therefore be taken more in the evening and not directly after meals. 14 Gillis, R.A.; Yamada, K.A. ; DiMicco, J.A. : “Central gamma-aminobutyric acid involvement in blood pressure control.”, Federation Proceedings, 1984, 43(1), S. 32-38.